I make no secret of my preference for the classic covers of the Silver Age era. These covers were drawn with such style and talent that the artist never seemed to be in competition with the subject matter. Nowhere was this skill more evident than in the war comics of the 1950s and 1960s. 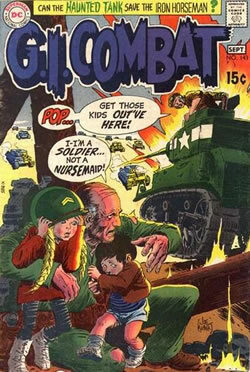 Artists like Joe Kubert, Harvey Kurtzman and Alex Toth seems to be drawn like moths to the war comics published by companies like DC and EC. 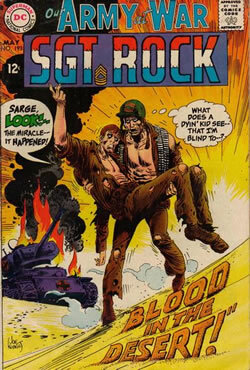 While the superhero books may have been more glamorous, probably sold better and were arguably more fun to draw, the war books were always a haven for some of the top creative talent of that post-war period. 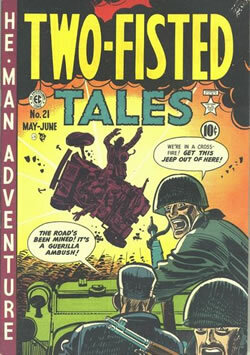 This cover by EC's Harvey Kurtzman uses back-lighting to highlight the drama of the exploding jeep. No muddle, no fuss, you can see exactly what's going on, despite the minimal drawing. Absolutely cracking cover design. The layout keeps leading the eye back to the old guy and the two kids.